As with most of my piping adventures, this one starts with someone asking me how to do something and then I take it way too far; and end up somewhere really cool! 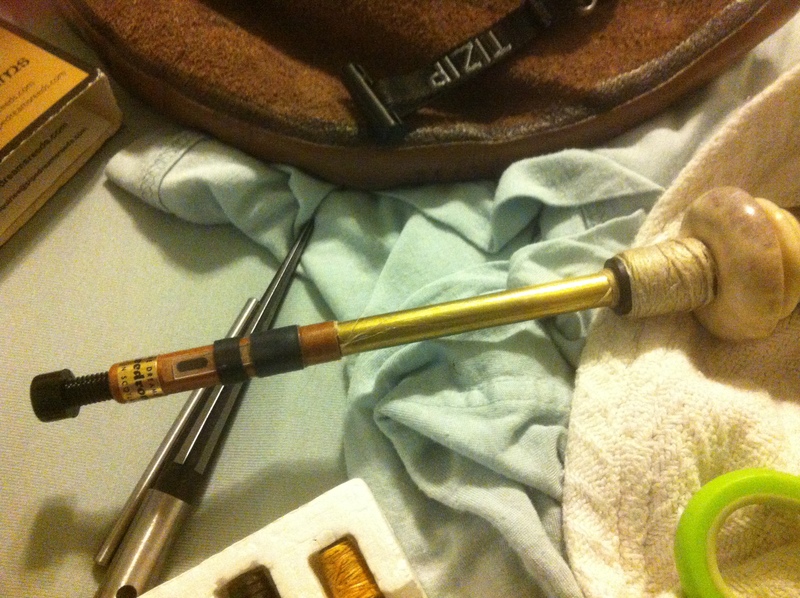 A local piper asked me, “How do you get your drones to tune to A440?” The answer, brass tubing! For bass drones and reeds, you’ll probably want 3/8″ K&S engineering brass tube, for tenors maybe the same or maybe 11/32″. It has to go on the outside of the reed tenon (where the hemp on the reed goes) but also on the inside of the drone reed seat (so it can’t be too big around). There are commercial drone extenders available but they do not get you down to A 440 Hz. The drone reed has to basically be sticking out the bottom of the drone stock just a little bit to have any chance of getting to A 440 Hz. See photo below of a tenor drone. I’ve had limited success with 1/4″ tube put inside the bottom of the drone reed. It would seem to be drone reed dependent. Of course, since I have yet to take this too far (there’s nothing new so far) I’m not actually going to use this to play with an A 440 Hz chanter (although I do have one). I’m going to use these now super flat drones to play with a normal A 470+ Hz chanter. Except, I won’t be tuning the drones to A but to the note G. Woot! These are 1950’s Henderson pipes with Rocket drone reeds, Colin Kyo Pipeband/Samurai chanter, Shawn Husk chanter reed. What’s tricky about tuning the drones to G is you have to retune the entire chanter. In a pinch it means taping every note except the Gs, and maybe F(#). I also tune the C to a C natural so as to play in the key of G. The tuning offsets can be had in the this chart (shift the note names around until the G is in the “A” spot). I can tell, you’re excited, because it sounds so cool! Hey, you can do it too! How? Go buy some brass tube (hobby or art shops usually have this), a tube cutter, and a cheap hand reamer (harbor freight has these). You’ll also need some teflon tape to seal the gap between the tube and the drone reed whether the tube goes on the outside of the drone reed tenon or the inside. Don’t forget the tube will have to also seat well in your drone reed seats. How to actually get it down flat enough is up to your pipes and your chosen drone reed. I’m using old Naill spec Rockets in the recordings above (there’s an “8” written on the bass drone tongue but that’s the only marking). The tube will need to be cut long enough so that the drone reed sticks out into the bag just a tad (bass drone stocks for tenors anyone?). You’ll also need a chanter that doesn’t mind a lot of tape. I went through 3 before I found one that worked well enough for my liking: old carved up CK, Kron Medalist, and finally, third time’s a charm, a new CK Pipeband/Samurai prototype chanter (Thanks Murray Huggins!). Make sure you set your equal temperament regular old Korg $20 tuner to read in tune/green light on low and high G (instead of low and high A). Then use the offsets from the table linked above to dial in your chanter. Again, I tune the C to a C natural so there’s lots of tape on my C (this is really where things can get wonky, you’ll note a reluctant chanter when it is hesitant to switch to the C natural note if coming from B or D). I guess you could learn to cross finger C natural, but meh, I’m lazy. You could also buy a Boderiou Bagad chanter that comes with pastilles (inserts) that turn your C into a C natural for you (also F into F natural if you wanted to play in C major, muahahahahahahaha). Lastly, you’ll need some tunes to play! Never fear, I’ve been playing smallpipes like this for a few months now and I’ve collected a lot of tunes in the key of G (again you need a C natural here; what’s the point of G drones if you aren’t going to play in G major?). The tunebook of my collected tunes can always be found on my Free Tunebooks page (you’re looking for the “A dorian chanter tunebook” as G major has the same notes as A dorian). I update it as I find new to me, but not copyrighted, tunes; always check back to see if there’s some new tunes. Also hit me up if you know of tunes that would work but I don’t have them in the book!